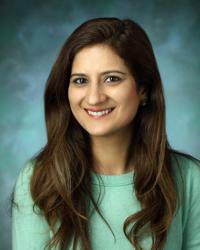 Priya Kundra, MD, is a highly experienced general endocrinologist at MedStar Washington Hospital Center and a clinical assistant professor of medicine at Georgetown University Hospital. Passionate about advancing the understanding, management and treatment of endocrine disease, Dr. Kundra is currently involved in research exploring new treatments for thyroid cancer and thyroid disease. She’s a member of the American Thyroid Association and the Endocrine Society, and sits on the Pharmacy and Therapeutics Committee at Medstar Washington Hospital Center. She has given numerous presentations and has published a number of original papers and book chapters. Dr. Kundra graduated from Duke University with a Bachelor of Science in Biology and received her medical degree from the Medical College of Virginia (now Virginia Commonwealth University School of Medicine). She then joined Georgetown University Hospital for internship and residency training in internal medicine before staying on to complete a fellowship in endocrinology and metabolism.